Yes, it’s very warm outside today and is forecast to be the same or warmer tomorrow. However, we’ve had warm March temperatures in the past, and still held the Sonot Kkaazoot as it has been for 31 years. In 2015, March was very warm like this spring and the Sonot Kkaazoot took place on March 28 that year—five days later than this year. Although the Chena River is not looking particularly solid for safe skiing, we have held the Sonot Kkaazoot on the traditional course starting and finishing on the Chena River for the past eight years (2011 to 2018). Before that, we had three consecutive years of alternate Sonot Kkaazoot courses, two years all at Birch Hill (2008 and 2009) and one year all on the Chena River (2010) to balance things out. Sonot Kkaazoot skiers have to be flexible at times and ski whatever conditions and courses Mother Nature tosses our way. 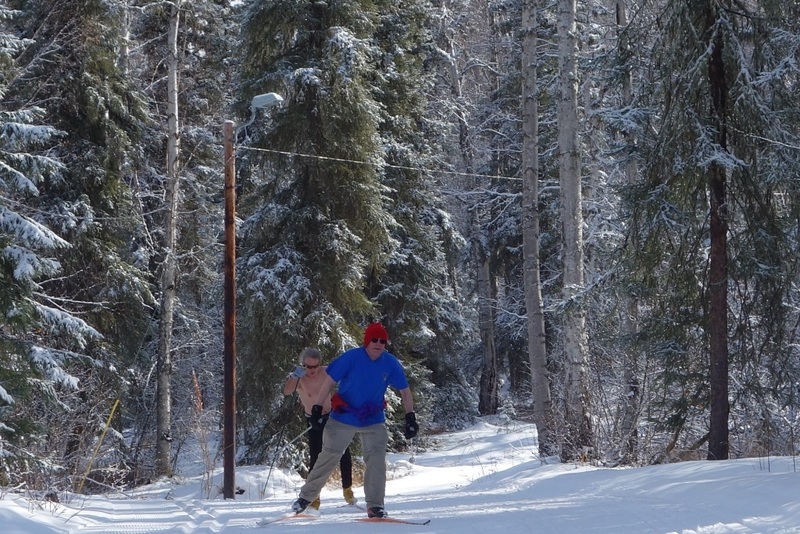 However, spring skiing in Fairbanks is always a special treat.